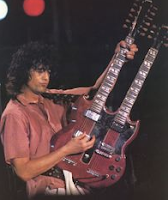 Jimmy used his 1971 cherry Gibson EDS-1275 when playing live performances of "Stairway to Heaven" so he would not have to pause when switching from a six to a twelve string guitar. Other instances in which he used it on stage were during performances of "The Song Remains The Same", "Gallows Pole", "Tangerine" and "The Rain Song," as can be seen in the Led Zeppelin concert film "The Song Remains the Same". Page used the EDS-1275 for live performances almost exclusively, rather than in the studio (the only exception being the track "Carouselambra" on Led Zeppelin's 1979 album "In Through the Out Door".